With St. Patrick’s Day coming up (and hopefully Spring as well) I thought I’d freshen up an old wreath for my front door. 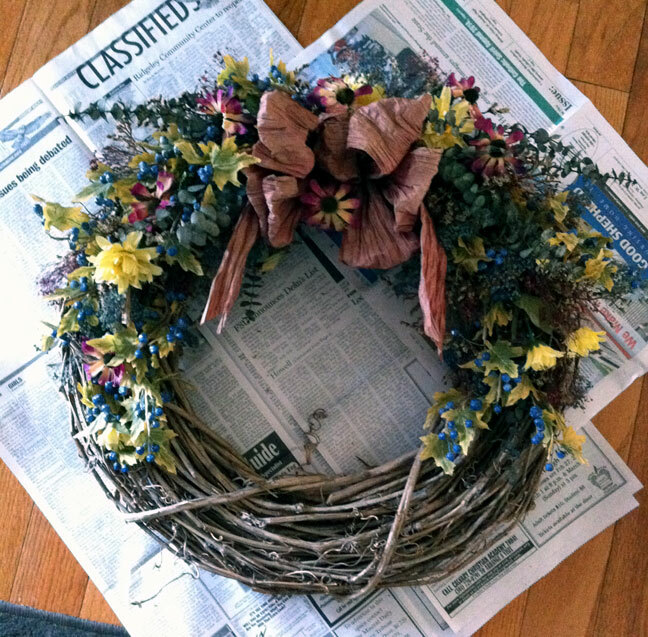 I found this wreath at a yard sale in Ohio when I was visiting my BFF in 2000. It was a nice big 24″ grapevine wreath but very sad-looking. The colored baby’s breath, eucalyptus branches, dried statice, and faded red paper bow were original. I added the yellow and dark red flowers and the leaves with blue berries. 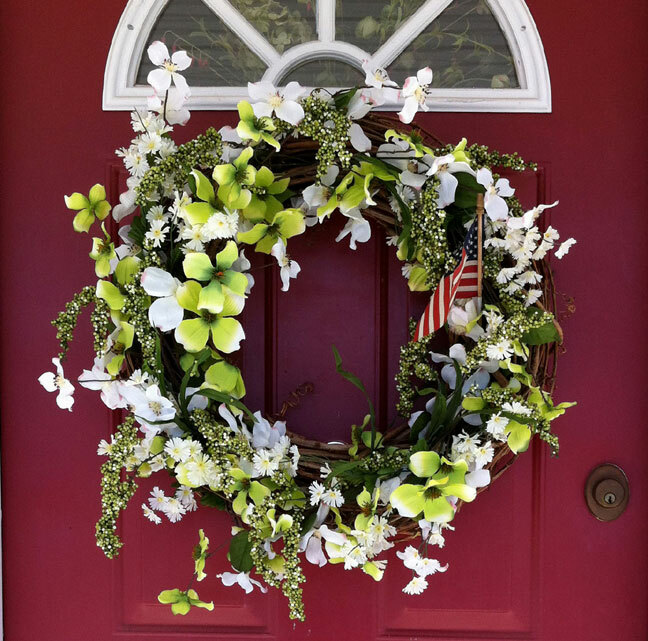 It was my late-August/early September front door decoration. I removed everything from the wreath and started over. 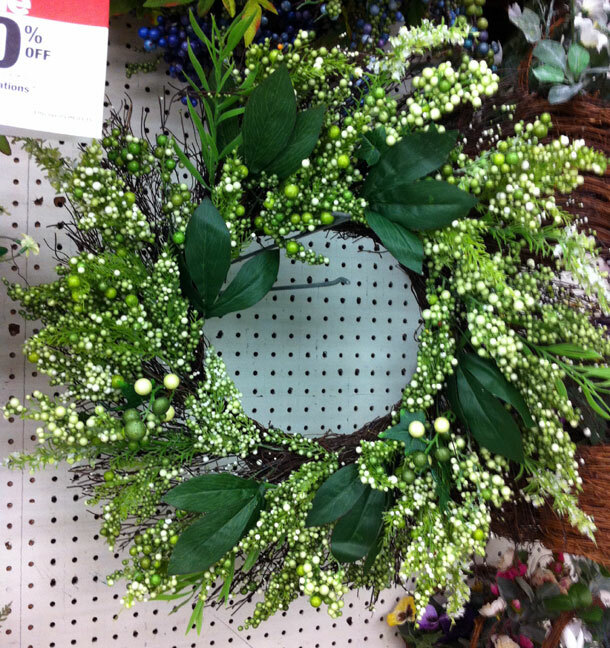 I was inspired by this lovely refreshingly green wreath at my local Joann Fabric store. It was on sale for $24.99 but just didn’t have the heft I wanted. I’ve discovered that with a red door that bigger and more contrast are better. So I purchased some green and white fake dogwood, some green shiny stuff made from tiny Styrofoam balls, and a couple of bunches of a small white flower. I cut some apart and stuck them in between the branches of the wreath util I was satisfied. Then I hung it on the front door and took a picture if it. First attempt. Even though this photo is straight on, the wreath looks lopsided. I didn’t notice it until I saw the photo. Second attempt. I moved some things around. Better but still not quite there. 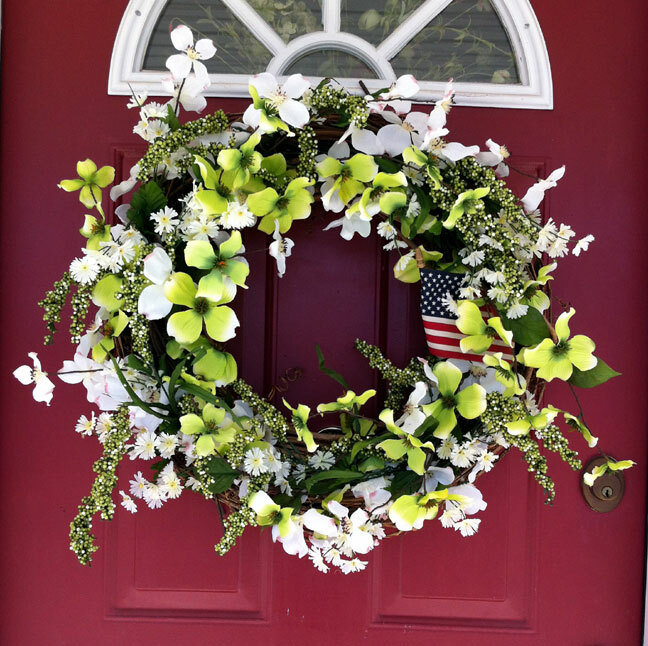 The finished wreath. I love it. And yes, I always add the USA flag to my front door. Except at Christmas. I think this looks fresh, green, springy, and ready for St. Patrick’s Day! 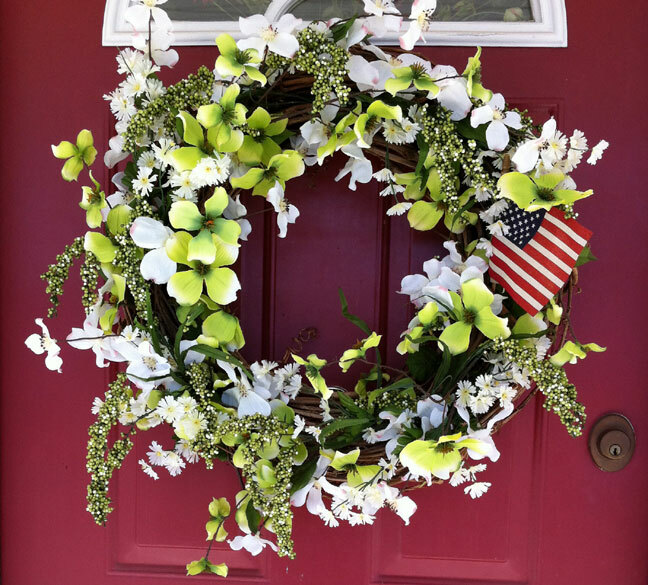 This entry was posted in decorating and tagged decorating, front door, grapevine wreath by Patti_is_knittinginflashes. Bookmark the permalink. Beautiful. I didn’t remember the wreath, but i did remember the fun times! !